Neil Pryde RS Racing and Slalom: Replacing the top batten. DIY: Making a spare mast from your broken mast. Is it possible? And how much does it change the bend characteristics? Most (all?) of us have tried to break our masts, and after the hard – and sometimes scary - hassle trying to come ashore with as much gear as possible, the questions about guarantee/the price and the delivery time for a new mast pretty soon fill our minds. However, when the dust from these battles has disappeared you've probably wondered: How about the broken mast pieces – can’t you make some kind of a useable mast from the remains? At this stage I'm NOT talking about recovering a broken mast to something that’s even close to the original mast performance wise (be prepared for a surprise). The preliminary thoughts are rather to have a mast that’s usable in the period until the you can afford a new mast or until the manufacturer has decided if he’ll give you a new mast for free - and until he's delivered it. And when you’ve had the broken mast replaced with a new mast, the broken (but now “recovered”) mast can change its role to a spare mast for future problems. So, what shall be indicated here is HOW far away from the original mast the recovered mast is as to stiffness and bend curve – and IF the recovered mast can be used with some sense at all. The subject for this little test is a North Platinum 2010 520 cm mast that broke in the first session on the water, rigged with a North Warp 2010 9.5 sail. 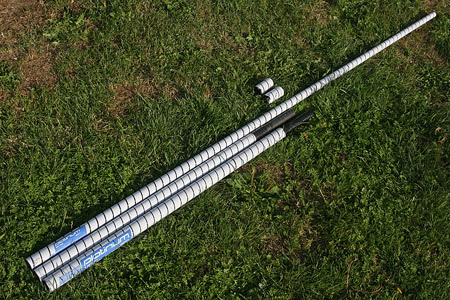 The breakage point was the usual one – just above the boom. Fortunately, before actually bringing the mast into use, it was measured for stiffness and bend curve, so that we’ve got the original test figures for the mast to compare with the test figures for the recovered one. You can find the original specs of the (later) broken mast here (find North Sails Platinum SDM 520 32CC, No. 1987.004, 2.2 kg, tested month/year 0510). - cutting off the damaged parts of the mast. In this case it was only necessary to cut off 10 cm on each side of the breaking point (you’ll also have to look inside the mast to decide how much material to remove), transferring the original 520 cm mast into a approx. 500 cm mast. - making a ferule of some old (broken) mast parts that fit into the mast around the breaking point. 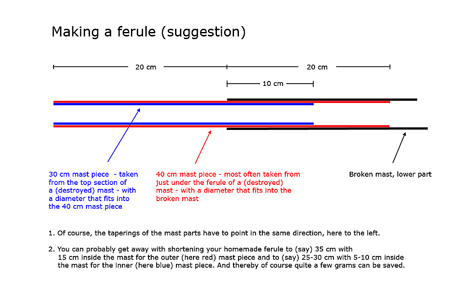 Not necessary go into details, but usually I make a ferule from an approx. 40 cm mast part and an approx. 30 cm mast part. The smaller part is glued (epoxy resin) into the bigger mast part, and the so made ferule is then glued into the lower part of the broken mast with approx. 20 cm sticking out. A little drawing explains better than lots of words (see below). - some finishing work might be necessary, and it can involve laminating on a little glass or carbon weave and/or some sanding work – but making and placing a ferule certainly isn’t rocket science. You can see the “recovered” mast below. In this case the ferule project added approx. 300 grams to the recovered 500 cm mast, but luckily the added weight is placed relative low down the mast. So the 2200 grams weight of the original Platinum 520 cm mast grows into 2500 grams for the recovered 500 cm mast. In perspective 2500 grams is a little less than the weight of the North Sails “medium quality” Silver SDM 490 cm mast (2550 grams). How ferules can be made. So, how far away from the original mast is the recovered mast then – and is it usable? Well, to be honest I would have expected that the extra ferule would have stiffened up the mast a little over all, and (as a consequence of this) the bottom half (with the extra ferule AND the original ferule now being placed relatively lower in the mast) would become a little relatively stiffer, resulting in a mast placed a little closer to Flex Top in bend curve than the original mast. This didn't happen! OK, you can argue that the mast perhaps is a little relatively stiffer overall (considering the approx. 20 cm shortage), but that certainly isn't reflected in a relatively softer top section (on the contrary). However, the next logical question might be, how far away from the original mast you get, if you extend the recovered 3-piece mast to the original length (520 cm). In a study of Neil Pryde X6 masts (see here) it was concluded, that "... when you extend a X6 mast (and any other mast for that matter) it grows a little more in relatively softness in the top..."
Given that the recovered 3-piece mast in fact became (marginally) less relatively soft in the top than the original mast, I think it's allowed to guess that extending the recovered mast back to the original length doesn't change it substantially relative to the original mast. I think the conclusion must be, that recovering a mast by converting it to a a 3-piece mast doesn't change it very much in overall stiffness and in bend curve relative to the original mast - and given that the new ferule is made durable a recovered 3-piece mast is very much usable. Perhaps it's even so usable that it doesn't need to be put away as a spare mast only ...?